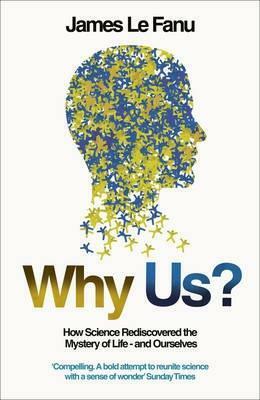 One of my favourite books I’ve read recently is “Why Us: How science discovered the mystery of ourselves,” by Telegraph columnist and doctor, James le Fanu. It’s said to “reunite science with sense of wonder” and it’s well worth a read. Essentially it’s a critique of Darwinism or materialism as an explanation for living phenomena, though not from the perspective of religion. The author seems to have spiritual beliefs but of an unknown variety. Personally I find it lacking some depth in terms of its critique of Darwinism – and there were facts that were not taken account of. However the book neatly summarises one of my biggest problems with the New Atheist arguments that use science to attempt to disprove the existence of God. Science is presented as if it has already answered all the questions of life, or at least the big ones. But nothing could be further from the truth. As we unravel the complexities of molecular biology – more problems arise. What seemed to be a simple explanation for phenomena becomes much more complex, or even untenable. I agree with atheists that this is not a reason to therefore decide “ah well, God did it then”, the infamous “God of the gaps.” The book has a tendency to do this (though it is with a “life force” rather than God, in keeping with the author’s beliefs) But it is a reason to generate humility and awe for the world around us. It’s important to acknowledge that despite all the efforts, all the research, all the great minds working hard on their subject, to the end that now, no one person could possibly know and understand all of the scientific discoveries and results we’ve achieved, at least in one lifetime – we still just don’t know. There is so much to learn, to understand. it is a mind-bending and humbling truth. Anyone who says we know it all, just exposes their total ignorance of all that we know. It’s a well-written and interesting book, and a great place to start exploring this topic. Don’t let the anti-Darwinism put you off, it does make interesting points and it’s not anti-science. In 2013 and 2014 I did some work for the Keswick Convention, turning some of its Bible talks into articles. What we are going to discuss is absolutely fundamental. The first page of Genesis is the charter of all human dignity and value. In the next 5 days, we will challenge, in the name of God and the Bible, the prevailing naturalism, that is regarded as the default in our culture. Genesis is a thorny subject for Christians, who tend either towards accepting evolution and seeing Genesis 1-2 as some kind of allegory, or they are six day creationists. The subject causes a lot of arguments. It all obscures the real beauty of Genesis 1-2 – the calling of creation ‘good’, the importance of living things and particularly humans to God, our vital responsibility in looking after the Earth and everything in it: there are so many crucial insights into our world in this short bit of text. I think I am unusual in being happy with the scientific evidence for evolution (though I often think bigger claims are made for it than can be currently justified) – but I don’t think Genesis 1-2 is only an allegory either. I think there’s no need for the polarisation that currently exists, and we end up missing the point. I think Lennox is near this position too – his talks are well worth listening to. You can get them free on http://www.keswickministries.org, or read a summary in these blogs. I’ll pull out some more stuff from them in the coming weeks, hopefully.